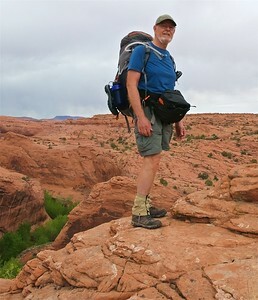 For the 32nd anniversary of our first canyon country backpack, we did a 7 night trip along the Escalante River in Southern Utah. 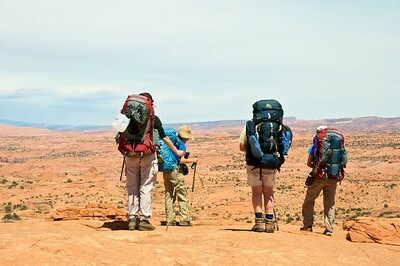 We dropped in from Early Weed Bench to Fox Canyon, down Twentyfive Mile Wash, then up the Escalante to Harris Wash, and out Harris. 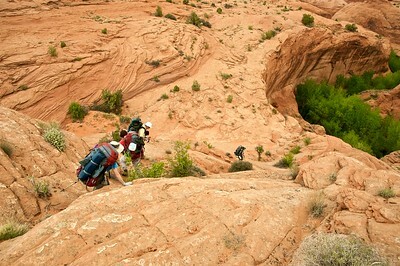 This area is home to three wonderful side canyons: Ringtail, Neon, and Choprock, which we had ample time to explore. 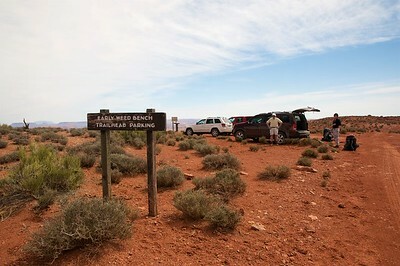 The road into Early Weed Bench trailhead was truly awful. In several places, culverts were completely washed out and the rear bumper of Roger's Pilot drug in the sand of the resulting washes. 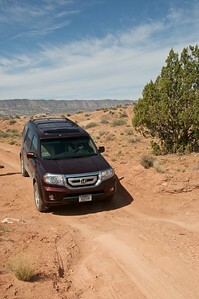 There was no way our shuttle car could make the drive, which added an hour plus of road walking to the end of the trip. 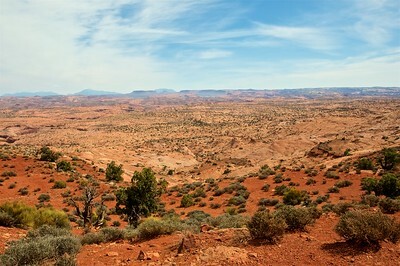 The view from the trailhead. 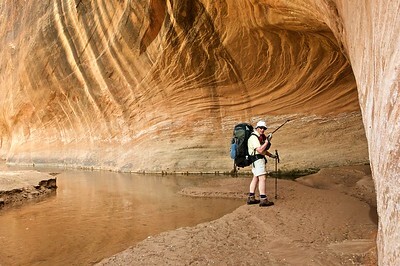 Below are the slickrock canyons of Fox Canyon, TwentyFive Mile, and the Escalante itself. We're off! 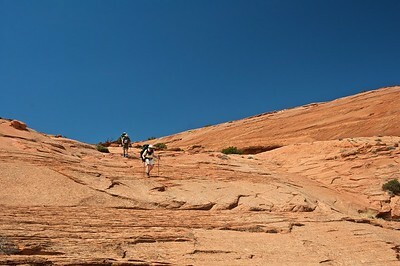 here's Roger following a faint trail. 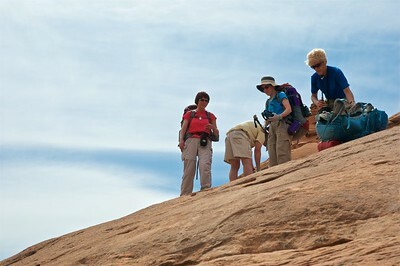 Without a defined trail, much of the way into Fox Canyon involves routefinding across the slickrock. 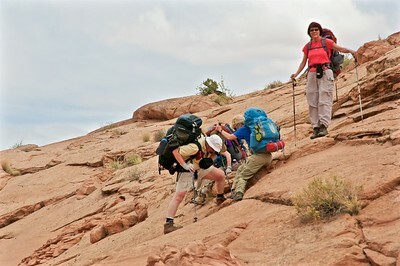 Working our way down the slickrock slopes. At the edge. 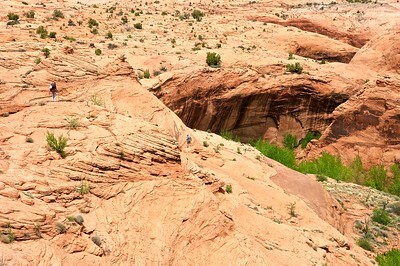 Still a long way down! 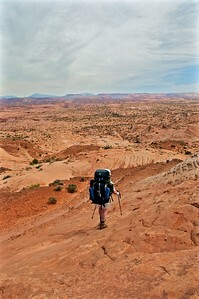 Sometimes a slide seemed safer than walking down the steeper slopes. Here is Sue illustrating, as Terri waits her turn. 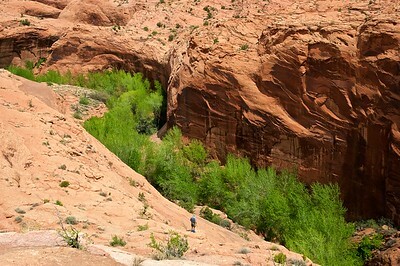 Will is searching for a safe way down the final cliffs into Fox Canyon, below. 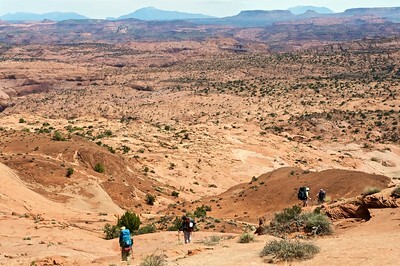 In the end, the darker knob of rock at the upper left was our route. 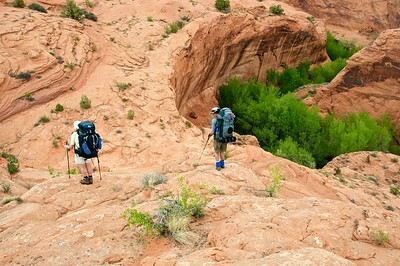 Terri, and Will below, looking for the route into the canyon. 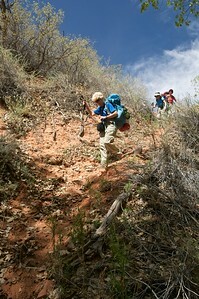 Roger is creating an extra foot hold, while Sue helps Susie with her pack on a steep section. 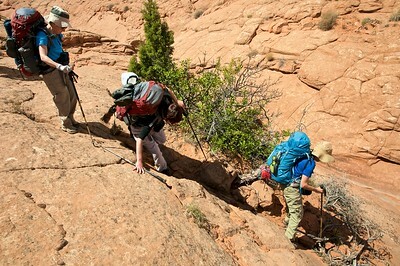 At this point most people took their packs off, slid them over the edge, while I grabbed them from below. 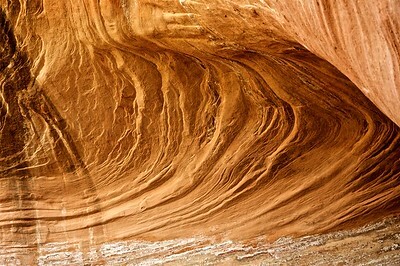 Rock like this actually has great friction. 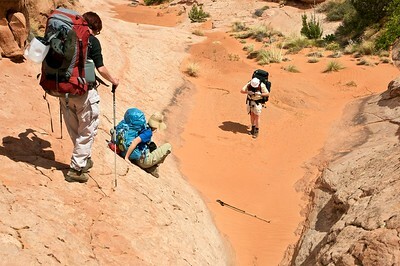 Once off the sandstone, we found a trail leading down a sand dune to the canyon bottom. 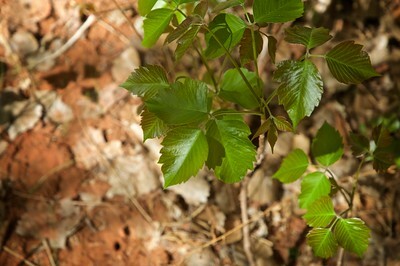 Have to watch out for poison ivy here! The leaves were fresh and oily. 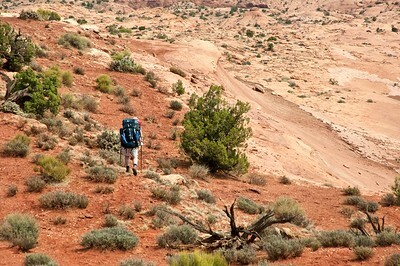 It took just a few minutes on the bottom of Fox to reach Twenty Five Mile Canyon. 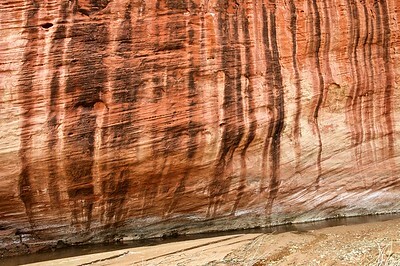 Here Roger is admiring some of the canyon walls. 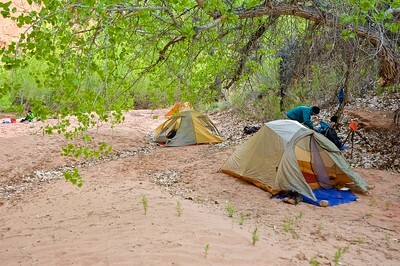 We found a nice sandy bench with cottonwoods for shade for our first camp.